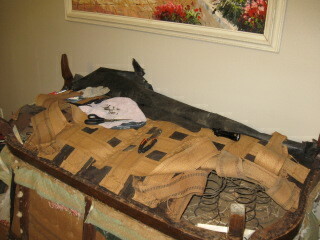 Our once pretty, clean living room has (once again) become a workshop, in this case, a furniture workshop. 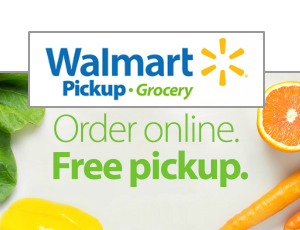 Actually, let me rephrase that. 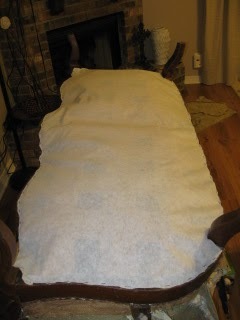 Our once pretty, clean living room has become a furniture operating room. Let me show you what I mean (be prepared for lots of pictures..."surgeries" of this magnitude and depth are very, very detailed). 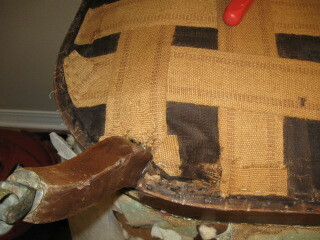 We realized that before we continued ripping off fabric and pulling out anymore staples from the "over-acheiver" love seat, we needed to get the back legs fixed. If they couldn't be fixed, there was no point in putting anymore manpower/womanpower (yep, that's right...womanpower) into pulling and removing, right? So, out came the sawhorses and upsy-daisy she went. As you can see, the left back leg is comfortably dangling while the right leg was completely pulled out with a tiny tug. 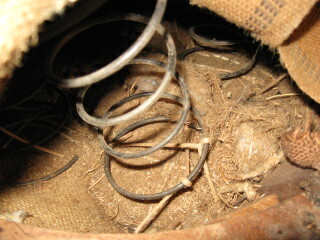 Thankfully, both legs were in great condition and, God-willing, could hopefully be used and re-attached. At this point though, we realized that the only way the legs could be fixed was by removing all of the fabric and obstacles around each. 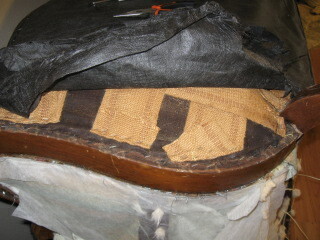 Covering the entire bottom was a thin black sheeting which needed to be removed first. It was ripped in some places already so all I did was tear the rest off, thinking I'd just buy new sheeting to replace it. 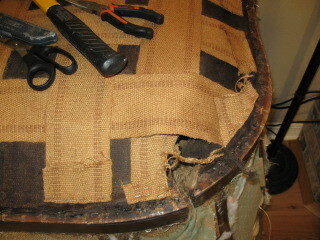 ...bands of strong burlap holding the seat springs in place with another layer of even thinner black sheeting underneath. So, I got to work...tedious, I-need-to-reuse-all-of-this, operating room work. (During this entire process I took tons of pictures for reference so that I put everything back in the exact order it was in - a very helpful, very important step for a beginner like me.) 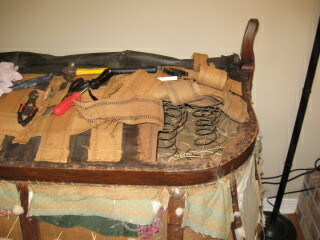 As I was prying off burlap straps, I realized how old this love seat really was. 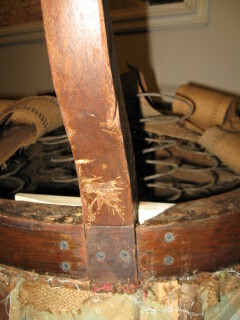 The pieces of fabric I had ripped off so far had been attached with staples, but these straps had been attached with old, rusting upholstery nails which told me the love seat had probably already been re-upholstered before. 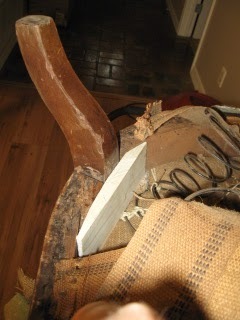 But anyway, history aside, strap by old strap I peeled away until I was left with two gaping holes on either side of the back of the love seat. 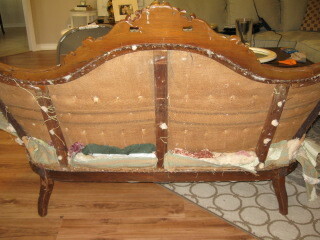 And man was it dirty and dusty inside the bottom of the love seat, again showing it's age! 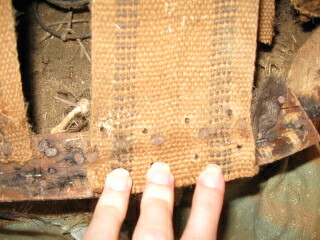 I even stuck our camera inside one of the holes to get an even better...er...disgusting perspective. A little eerie, huh? 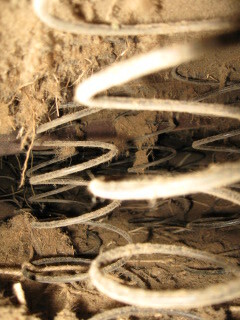 Don't worry though, most of it got sucked up with the handy shop-vac...thank goodness because I'm allergic to dust! 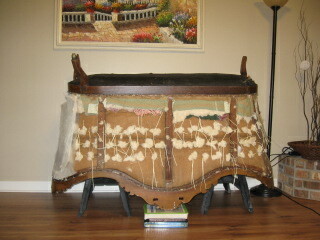 First, we removed the casters from both legs by simply unscrewing them and pulling them out. Since the front left leg is unable to have a caster (it was apparently ripped out, taking half of one side of the leg with it...but the leg still works), we're not going to use any casters at all. Next, using a piece of wood we already had, Anthony cut two pieces to fit into the love seat right behind each leg and glued them into place. They will serve as reinforcement. Gluing them in was just an extra, optional but pre-cautionary step. Nice and put together! We weren't done yet though. 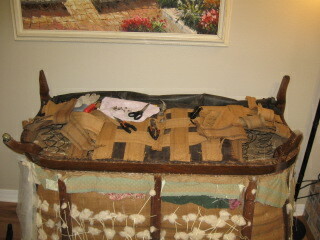 We still had to put some sort of backing over the burlap straps. 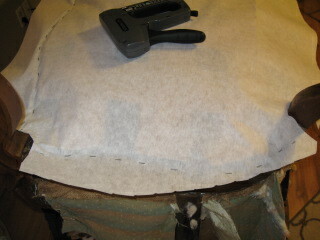 I ended up finding and using a heavy duty, Pellon brand backing from JoAnn Fabrics. It was white (they didn't have black) but I didn't think it would be a big deal since 1) it won't be seen unless you're hiding out under the love seat and 2) I'm planning on painting the love seat a lighter color anyway. So, I laid the backing across the bottom of the love seat and cut a rough template just so that I wouldn't have bunches of fabric everywhere. 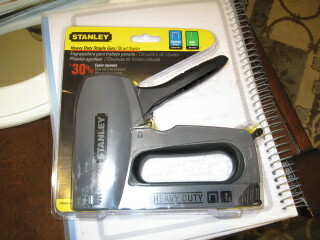 Then I got to stapling. After it was all stapled on and secured, I simply cut around the edges to reveal a perfectly fitting backing and one great looking undercarriage. She went through surgery like a champ and is on her way to making a full recovery! I even sat on her and she felt as solid as a rock! I envisioned future naps, children jumping (and me yelling not to), movie nights...the whole nine yards! 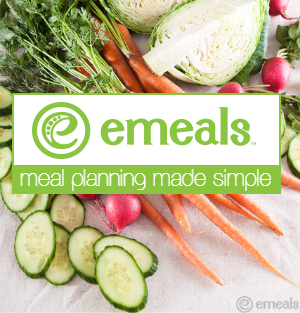 Oh yeah, you've probably noticed all of those little dots of stuffing are gone too! 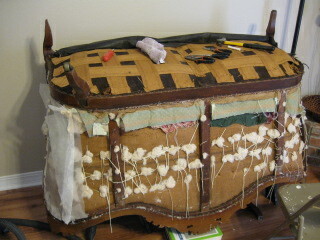 Those, as you might've guessed, were the strings and stuffing attaching the upholstery buttons. I sawed them all out with a razor blade while Anthony was doing his magic with the drill. There were 64 buttons in the couch! 64! Well, they're gone for good now...adios, adieu, and hasta la vista! And, speaking of goodbyes, I really should be getting back to making the valances I mentioned earlier this morning so ta-ta for now! 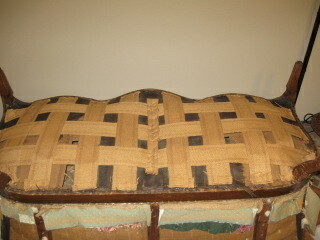 You can be sure I'll be back with more on the love seat later! Have an awesome weekend!